Message from Martin County: What’s good for Eastern Kentucky good for U.S.A.
Eastern Kentucky needs a nation that’s committed to economic justice. What we have is identical in Martin County and the U.S.: Great wealth concentrated in the hands of a few while the middle class is hollowed out and those at the bottom watch their opportunities dwindle along with their hope. It’s always been easy to think of Eastern Kentucky as separate and apart from America’s mainstream. It was true at the turn of the 20th century when John Fox Jr. wrote wildly popular novels about guileless mountaineers. It was true in 1963 when Harry Caudill wrote of the region’s brutal exploitation in Night Comes to the Cumberlands, the book that launched a War on Poverty. And it’s true today when we read of poverty’s stubborn persistence 50 years after Night in Herald-Leader reporter John Cheves’ powerful reporting from Martin County. Martiki Mine in Martin County. 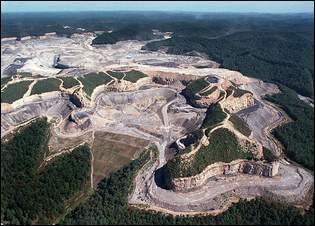 EPA has loosened restrictions on selenium pollution from mountaintop removal mining, resulting in widespread destruction of fish. The temptation is to think of this troubled, yet compelling, place as aberrant and unique — The Other America, as Michael Harrington said in the title of his famous 1962 book about poverty in America. But the notion of Appalachian exceptionalism has never been reality and is more wrong today than ever. Far from being an outlier, the region, if anything, is a microcosm of this country and the challenges facing all of America. Any plan for igniting Eastern Kentucky’s moribund economy will have to be built on principles that would work anywhere: Local ownership; support for entrepreneurs; a healthy, educated workforce; healthy land, clean water, good food; towns and parks where people want to visit, live and invest; accountable, honest government; clean energy, and, as Lexington Mayor Jim Gray often says, an authenticity of place. By the same token, Eastern Kentucky can never pull itself up in a country where the deck is stacked overwhelmingly in favor of the rich and powerful, where Congress won’t raise the minimum wage to make work a rational alternative to disability, or tax the wealthy to support early childhood programs, first-generation college students or the kind of investment in research and infrastructure that built U.S. prosperity and the middle class. 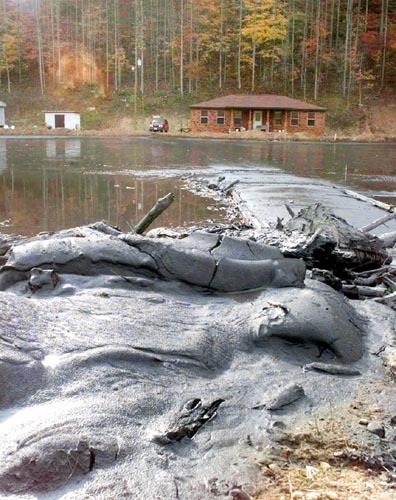 250 million gallons of coal sludge released into Big Sandy Creek block access to a home in Martin County, KY.
Another common thread will sound like fighting words in coal’s kingdom. The 21st century’s biggest challenge will be making the transition away from fossil fuels to avert a climate catastrophe without strangling economic opportunity. Since the 1970s, any prosperity in Martin County, limited though it has been, came from coal. The price has been poisoned water, land and, according to a growing body of science, sickened people. 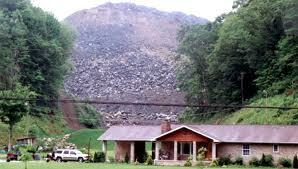 Even without the climate crisis, though, Eastern Kentucky coal has become noncompetitive in the marketplace. 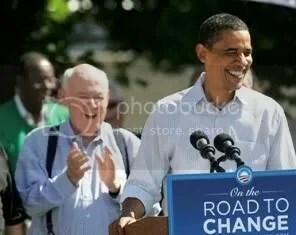 Hardly anyone relishes change, but when change is inevitable, the smart look for opportunities. Corruption, as endemic to Eastern Kentucky as ginseng and gospel hymns, is far from unique to the region. Somehow, though, our despair grows the closer the corruption. An impoverished place like Martin County steers college scholarships to the children of public school administrators instead of poor kids and seems just plain hopeless. Meanwhile, we tolerate a U.S. tax code that’s a collection of favors for the special interests that finance political candidates. 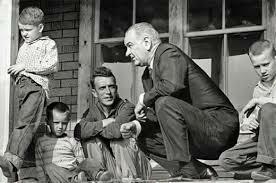 Soon after President Lyndon B. Johnson declared the “War on Poverty” in 1964, he visited Martin County. He was photographed with the Fletcher family on their front porch. The fact that the mountains have no corner on corruption does not excuse the plague of grand and petty thievery, cronyism and nepotism. Eastern Kentucky must clean up its image by eradicating corruption if it is to attract outside private investment or keep its bright young people. Honest competitors will go elsewhere to find a game that’s not fixed. And, just think, if Eastern Kentucky leads, maybe Congress will take a hint and clean up the tax code.